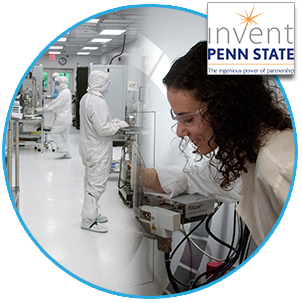 With Centre County home to the main campus of Penn State University, businesses benefit from workforce talent, world-class research and technology transfer services. Companies like Boeing, Honeywell, GE and 3D Systems already have discovered the advantages of research partnerships with Penn State. Access to state-of-the-art facilities and leading-edge researchers is beneficial to companies of all sizes. Sealing the deal is the university's favorable intellectual property policy for industry-funded research, which eliminates negotiations over IP rights. On May 1, 2015, the CBICC and Penn State University signed a historic economic development Memorandum of Understanding designed to enhance economic and workforce development in central Pennsylvania. Through this partnership, Penn State and the CBICC will work together to build a nurturing and collaborative environment in which professionals, entrepreneurs and businesses of all sizes can thrive. Read the MOA. Penn State President Dr. Eric Barron and CBICC President and CEO Vern Squier sign the Economic Development MOA. "The aim of Invent Penn State is to drive job creation, economic development and student career success by connecting researchers with the people who can help bring their discoveries to the marketplace."